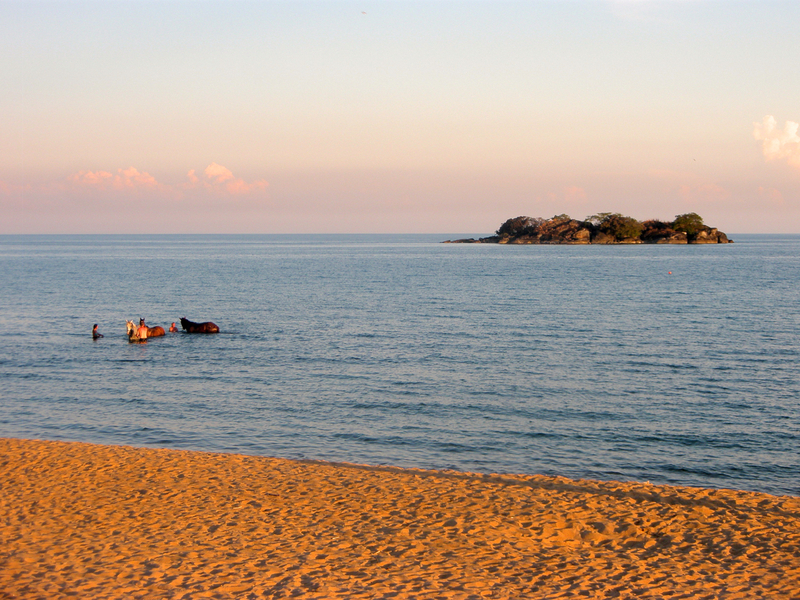 One of the stops we made while traveling through Malawi was at a beautiful spot right on the shores of Lake Malawi called Kande Beach. Kristin had gotten us all excited by dropping hints at how great Kande Beach was, but even after all the hype, we were still in awe when we arrived. All day, Peeky (our expedition truck) had been straining and struggling, winding his way up through the hills and peaks of the southern Great Rift Valley. Turn after turn, village after village- we began to think we were NEVER going to make it over those hills. Finally, late in the afternoon, we came to the crest of the final climb, and instantaneously, the lake spread out before us in the green valley below. 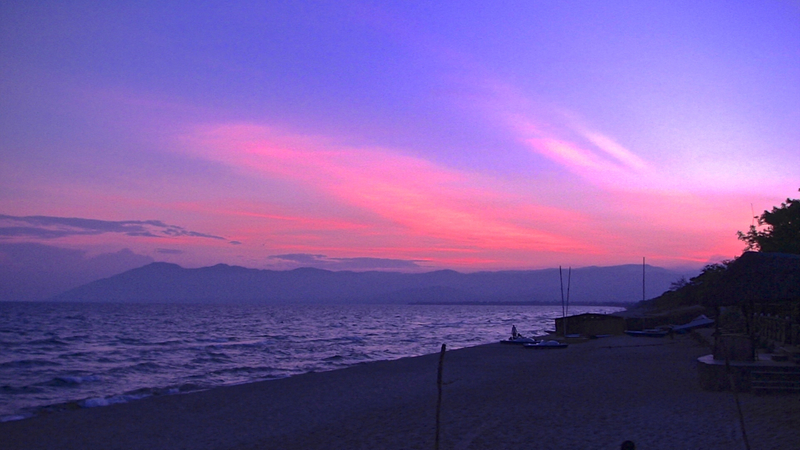 Now, to set the scene, one first must know that Lake Malawi is the 3rd largest lake in Africa and the 8th largest lake in the world. So, its a pretty big lake. The sight that greeted us on the other side of the pass was incredible- deep blue water stretching out to the eastern horizon, a ribbon of yellow sand running along the line where the lake met the beach, white-capped waves crashing along the shore, the late afternoon sun glinting gold and orange off the breaking waves. Needless to say, we were all anxious to go for a swim as we made the descent down to the lakeshore. The truck made the customary bumpy drive down the entry road to Kande Beach (EVERY entry road to EVERY campground in Africa made riding in Peeky seem as if you were on a roller coaster- massive potholes, huge speed bumps, ruts, rocks, and roots- an ‘African Massage’, according to the locals…), and as we ground to a halt, we all hurried off the truck, anxious to explore the new campground. Of course, we had to suffer through the mandatory ‘New Campground Orientation’ first- Kristin pointing out the location of the toilets and showers, where we would be setting up the cooking equipment, what groups were on what chores, where we could pitch our tents, etc. Typically, it then turned into a mad dash of people trying to secure the most ideal sites for their tents, but at Kande, all the tents were set up under an open-air thatch-roofed structure- a mini commune of sorts- so there was no rush to get the better ground. Anyway, everyone was more interested in getting down to the beach and going for a swim. Swimmers on, and we were off! The campsite was awesome- not only was there an amazing beach and a crystal clear lake, but as we hurried down to the water, we saw that there were umbrellas set up and volleyball nets waiting to be used, lounge chairs and hammocks waiting to be lounged in, a huge open-air bar stocked full of cold beverages, just waiting to be consumed- it was like we were on vacation- ON OUR VACATION! Pretty cool… There would be time for all of that later- at that point, all any of us wanted to do was DIVE IN! That first swim in Lake Malawi was probably one of the best of my life- we had been cooped up in the truck all day, getting increasingly antsy and anxious to get to the campsite, the heat and the dust of the African roads stretching every hour out like warm taffy- and finally here we were, running through the hot sand and diving into the cool waters of the lake- utter and complete bliss. The water was SO clear and so cool on our skin after the long, hot day in the truck. What hit me the most was that it felt so CLEAN- it was fresh water, not salty seawater- an odd sensation when diving into such a large body of water off a hot sandy beach. We swam about and splashed around for a while, soaking ourselves and body surfing the waves. I couldn’t get over it- body surfing- ON A LAKE! It was amazing. Eventually, we all made it back up onto the beach and collapsed on the lounge chairs, exhausted from a long day, but refreshed at the same time from such a great swim. It didn’t take long for someone to say “All I need now is a cold beer…”, and we were off to find the bar. 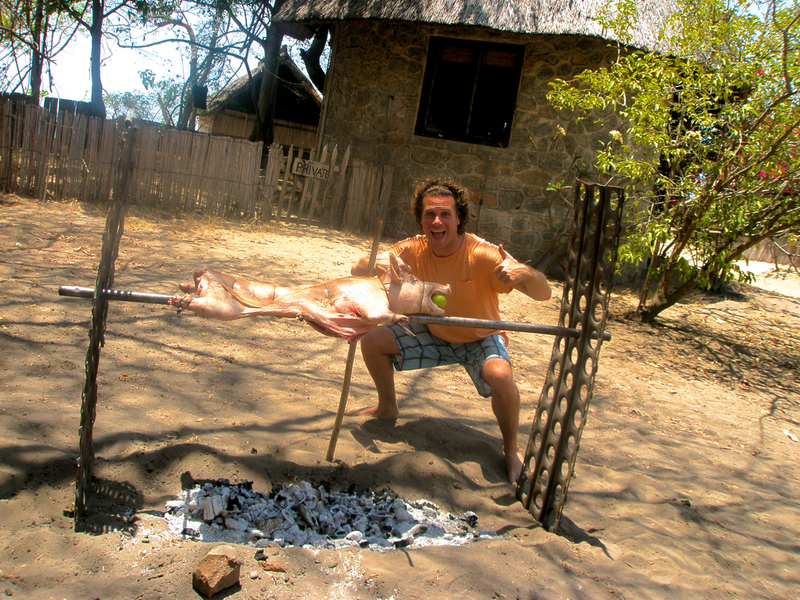 We had three days to relax and enjoy Kande Beach- there was a pig roast on for the second night, complete with Joash’s famous Jungle Juice punch, and rest of the time was open for anything and everything. We found out that Lake Malawi is a famous freshwater SCUBA dive site, there being more species of fish found there than any other lake in the world. 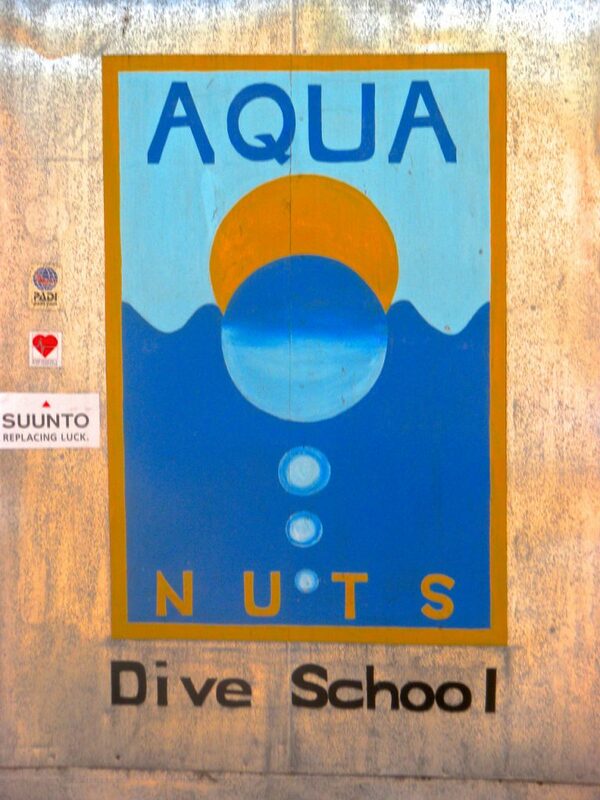 We booked dives for the second day- I had never done any freshwater diving, and was excited about adding that to my dive log. We knew it was going to be a great few days on Kande Beach, and wanted to make sure we were taking advantage of every minute we had. Let the relaxing begin!